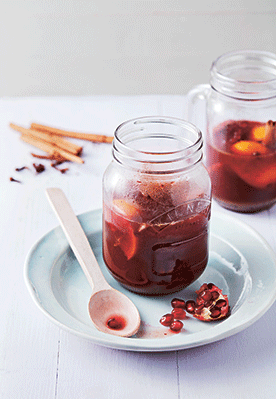 Warming, spicy and uplifting, this is just what you need on a chilly winter’s day. The matcha flavour is subdued by the other ingredients – but it’s there, doing its good work! 1 Whisk the matcha in a small bowl with a little of the pomegranate juice until smooth. 2 Squeeze the juice of one clementine and put in a saucepan with the remaining pomegranate juice. Stud the remaining clementine with the cloves and cut in half. Add to the pan and heat very gently for 2–3 minutes. 3 Add the pomegranate molasses to the pan with the matcha mixture, a sprinkling of sugar if you find the flavour too tart, and the pieces of pomegranate. 4 Pour into heatproof glasses, adding the fruit and cinnamon sticks to serve.